3 Rivers Striping and Sealcoating Tulsa OK can also repair your parking lot or driveway prior to sealcoating. We consult with you before the job to avoid minimal down time for your clients. Crack filling is done to fill cracks and voids to prevent water penetration and movement on your driveway or parking lot. It is best to fill cracks before Sealcoating. We use a direct fire hot pour machine to heat and apply to the effected areas. 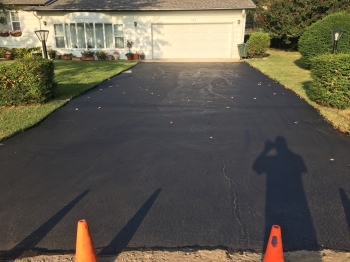 We can repair asphalt and do asphalt patching on just about any parking lot or driveway, as well as private roads. Located in Fort Gibson and Tulsa areas. Servicing Eastern Oklahoma and Western Arkansas. Call our office 918-351-4347 or email us for your free estimate on any parking lot repair that you may have including crack filling, pot hole repair,and asphalt patching etc. 3 Rivers Sealcoating Tulsa OK will give you an estimate on sealcoating as well when we are repairing your parking lot. We're here to help!